Bon Eats: Hear Me Rawwwwrr! Belmonte Raw finally opened its doors two weeks ago. It was the very few establishments I could actually dine at while I'm on my detox, so a visit to Carol and her shop was in full order this past weekend. 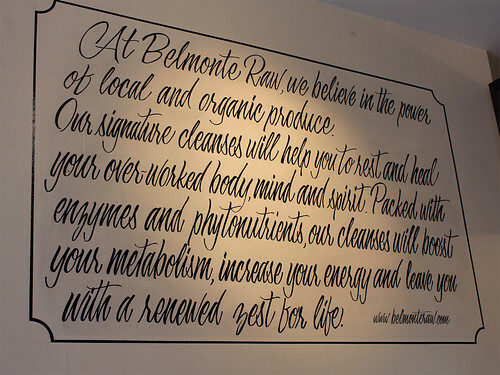 I had the pleasure of meeting Carol, the brainchild behind Belmonte Raw, a few weeks back. 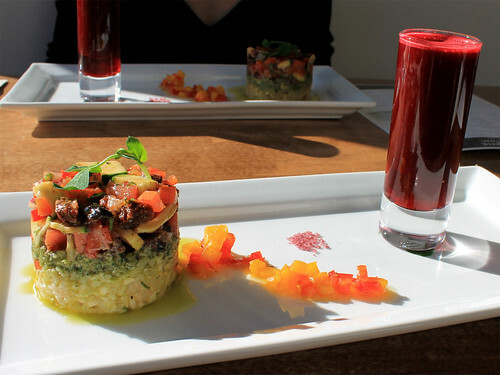 Belmonte Raw specializes in cleansing, healing and detoxifying juices and meals. Started as a delivery-only service to corporations and homes, when I met Carol, she was telling me about how she was finalizing her restaurant/retail shop. 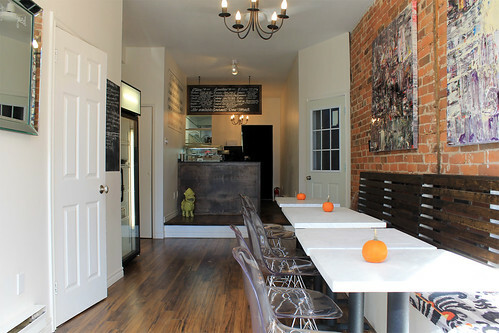 Belmonte Raw, located on Queen East between Carlawe and Pape, is a quaint little space. With no sign up yet on the exterior, I almost walked by the shop until I spotted a beautiful wooden table in the windo—a clue that this must me the place as Carol was talking about this table, made by a local couple, a few weeks back. It's a beautiful, warm and inviting space with some nice touches Carol has added—large paintings, marble tables (recycled from the pieces that fell off the Bank of Montreal in Montreal), chalkboards, and lots of natural light from the south-facing window. Basically, it's a great space to hang out, catch up with friends, and enjoy a delicious meal at the same time. 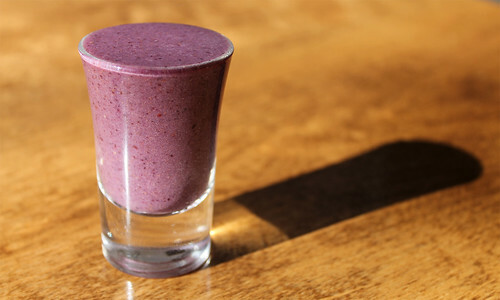 We started off with a shot of one of their smoothies, the Release, made with almonds, banana, mixed berries, maca, lucuma, camu camu, acai cacao, agave, and apple cider vinegar. This was a visual stunner as it arrived at our table, in all its beautiful purple glory. It was super tasty too—creamy and fresh tasting. Next, Carol took us through a tasting of some items off the menu. Each dish was paired with a juice shot, something she's been playing around with in the kitchen for future private dinner events in the space. 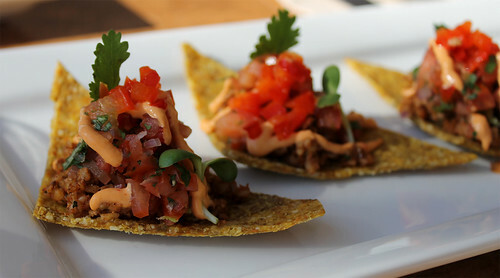 Raw corn chips, spiced walnut "meat", chipotle not-so-cheeze, red pepper, cilantro. Served with the Wealth juice as an amuse bouche to get us salivating. Raw burrito made with spiced sunflower "meat", chipotle not-so-cheeze, assorted sprouts, tomatoes, red pepper, jicama, cilantro, wrapped in collard greens. Served with a "tequila" shot that tastes just like tequila! Sun burger and fries, the patty made from pumpkin and sunflower seeds, lettuce, tomato, pickles, assorted sprouts, raw sun-dried tomato aioli, and raw onion flatbread. Served with a side of crispy jicama fries, spring slaw, and a chocolate malt shake. Mediterranean salad, composed of lemon-parsnip-jicama "couscous," pesto, zucchini, red onion, tomatoes, red pepper, artichoke hearts, and black olives. Served with a beet and balsamic vinegar juice shooter. 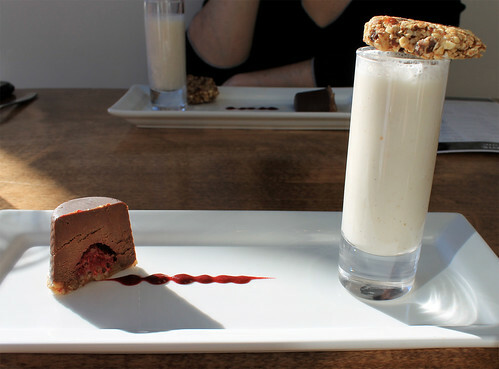 Best of all, I could have dessert at Belmonte Raw, as they are gluten- and sugar-free. We were served Carol's take on the classic milk and cookie--vanilla-infused cashew milk and oatmeal raisin cookie, made of nuts and raisins and then dehydrated to give it the right cookie texture. There was also her much-talked-about chocolate raspberry thimble (she also does a chocolate peanut version), made of raw cacao, cashew milk and agave with an almond and raisin crust, and a raspberry centre. It was super silky, rich, and decadent, and I couldn't even tell it was vegan. Lunch ended up being a three-hour affair, and you know what? I'm glad. Because in today's fast-paced world, who actually takes the time to enjoy their meal, let alone lunch, down to every single ingredient and detail. 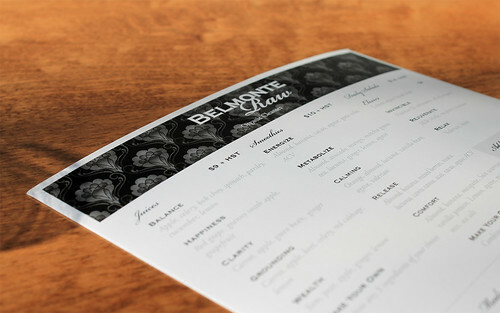 I was blown away by what I experienced at Belmonte Raw. 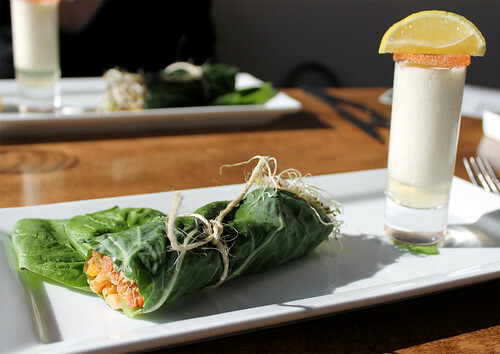 Not having dined in many vegan restaurants and this being my first raw experience (excluding sushi and meats that is! ), I didn't know what to expect. But everything I ate exceeded all expectations and more. Carol and her crew are doing something truly unique in this city. There's more to her food than just filling your belly. Her foods really do help reenergize you, and Carol pays very close attention to the nutrients in each of the ingredients she uses, as well as ensuring there's a balance of energies in the food she feeds us. She is also incredibly creative, manipulating vegetables, nuts and seeds to recreate different textures and flavours we are so familiar with to give us the full dining experience. Walnuts and pumpkin seeds become ground meat. Dehydrated tomatoes as black olives. And who would have thunk that cashews could be so versatile? Along with the food and juice pairing dinner events Carol will be rolling out soon at the retail shop, she is hoping to start teaching classes in the space as well and educate Torontonians how easy it is to cook the way she does at home. Even if you're the biggest of meat-lovers, I suggest you go and check out Carol's place and give it a shot. Go with an open-mind, and I can guarantee that even if you don't fall in love with her kind of cuisine, you'll come away from Belmonte Raw with a whole new way of looking at it, and food in general. View more of my photos from Belmonte Raw here. 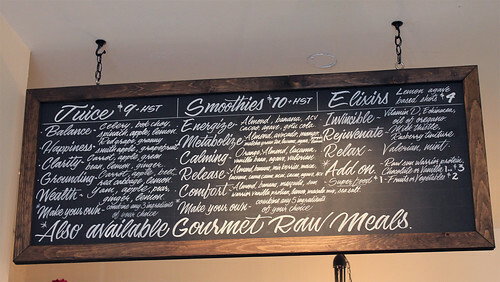 The Food Junkie November 10, 2011 at 11:50 a.m.
Everything looks so good at Belmonte Raw. I've added it to my list of restaurants to try now :) Thanks!